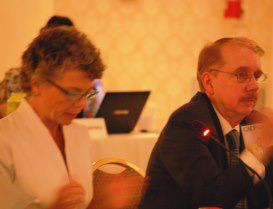 Camilla Benbow, Council for the Accreditation of Educator Programs Commission Co-Chair, and CAEP President James Cibulka guided the discussion. WASHINGTON — When teacher preparation schools recruit and select candidates, those entering should reflect the diversity of the nation’s P-12 students and, as a group, be academically strong — in the top one-third of their class with minimum GPAs of 3.0 and cut-off scores on academic-assessments including the SAT and ACT. These were among the standards a national commission that met this week is recommending for all teacher education programs. If approved, the standards would be rolled out in 2014. The Council for the Accreditation of Educator Preparation (CAEP), the newly formed national teacher education accrediting body, assembled the 28-member commission of educators who represent P-12 and higher education. The CAEP board is expected to vote this summer on the recommendations. But a negative impact on minority student enrollment in teacher education will be inevitable, suggests Christopher Koch, state superintendent for the Illinois State Board of Education. As Illinois has phased in higher cut-off scores for entrance into their teacher preparation schools, student enrollment has taken a hit. “It’s been tough for everybody — for Whites, for Latinos, for Africans,” added Koch, also a CAEP commissioner. “But because we had so few minority teachers to begin with,” Koch said, the drop in admissions was glaring. “Innovative approaches” to recruit and retain diverse students, Koch said, are among the changes needed to offset the decline and boost interest in teaching. As written, the standards call for CAEP to monitor and gather data on how higher standards for selection are impacting minority student enrollment. While CAEP Commissioners don’t serve as representatives of their institutions and organizations, Dr. Tina Marshall-Bradley, a professor and associate vice president of academic affairs at Paine College, is the only commissioner affiliated with a historically Black institution. Dr. Sidney A. Ribeau, president of historically Black Howard University, was listed among the original list of CAEP commissioners, but “he has not attended any of its meetings,” said a CAEP spokesperson. Diversity and equity in a variety of areas and measures were among the issues of debate and lengthy discussion during the meeting here, but in the end, CAEP commissioners moved forward, modifying original language in some places, but agreeing to keep in place the academic requirements students will have to meet. Despite public concern and urging for a separate standard on diversity in teacher education, CAEP chose to “integrate” diversity as a measure for things like student recruitment and curriculum content throughout all five standards, said Camilla Benbow, its co-chair and the Patricia and Rodes Hart dean of education and human development at Vanderbilt University’s Peabody College. The schools will also have to disclose their student-loan default rates, another concern that Black college deans railed against in a March letter to CAEP in response to draft standards the accrediting body first circulated to their constituents. Like the deans, some on the commission also debated the relevancy of using student-loan default rates, but their use in annual reporting remains among the list of things CAEP will require and monitor.